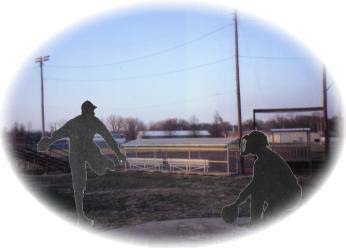 On October 24, 1913, more than 3,000 fans watched the Chicago White Sox and New York Giants play baseball in Blue Rapids, Kansas, on the field that is still in use as a ball field today. Baseball legends like Jim Thorpe, John McGraw, Sam Crawford, Bill Klem, and Christy \"Big Six\" Mathewson were there that day. While in Blue Rapids, be sure to visit the historic Public Library. It is one of the oldest public libraries west of the Mississippi River still operating in its original building. Also, just north of town is Alcove Spring Park. Alcove Spring is one of the most historic camping stops on the Oregon Trail. Such people as Kit Carson, John Fremont, and the Donner Party camped there while heading west. Alcove Spring is now a 200 acre park open to the public. The townsite for the development of Blue Rapids was chosen at the junction of the Big Blue and Little Blue Rivers in 1869, by the Genessee Colony of LeRoy, New York which was organized with plans to build a model community in the Midwest. It was, and is, an area which boasted abundant and good tasting water, oasis-like beauty and rich natural resources. A dam was built across the river to generate power for a woolen mill. In 1902, a fire destroyed several of the industries, and the 1903 flood waters completed the destruction. After these disasters many of the business places were rebuilt away from the river\'s edge at the site of the present day business district. The community continued to prosper by centering on the gypsum industry. In the early 1900\'s there were four gypsum mines in operation. Today only one remains, with a supply of gypsum estimated to last at least one hundred years. In 1958, the gates to Tuttle Creek Lake on the Big Blue River were closed and water covered a large trade area important to the town. Many industrial and residential changes were made because of it. The two room Holm cabin was built by Swedish pioneers in approximately 1876 of hand hewn logs of oak and door frames of walnut. The cabin was lived in until about 1981. The downtown area is built around a Fountain Park which gives Blue Rapids the distinction of being the only round town square in Kansas. Founders platted the town much like those in New England to include a "hub"